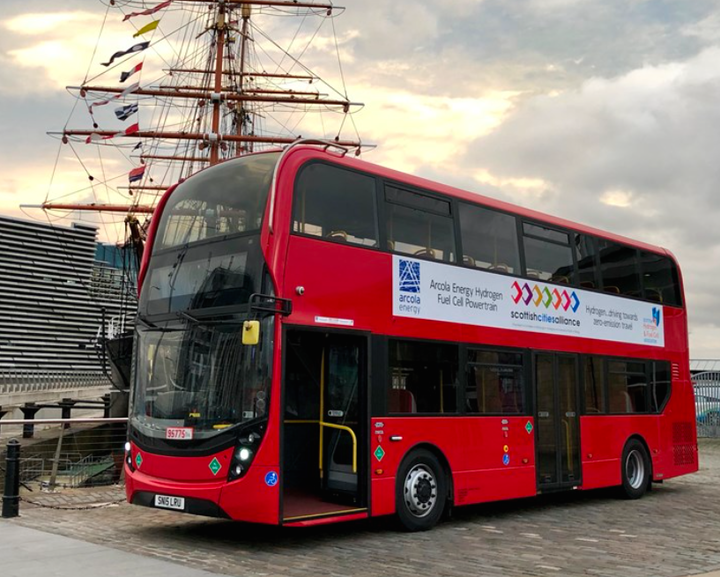 UK bus bullders Alexander Dennis launched their hydrogen double decker in November 2018, in collaboration with Arcola Energy. �Hydrogen feeds a fuel cell which generates electricity which charges the battery that powers the electric motors on the axles. A FUTURE LABOR GOVERNMENT’S� $3 mln Hydrogen Innovation Hub in Queensland will be the latest entrant in an already crowded field. Hardly surprising, given that the International Energy Agency has estimated the global market for hydrogen at $US155 billion ($A 215 billion) by 2022, and that a number of countries such as Japan are already implementing hydrogen import policies. The following are just some of the many developments that have recently taken place around the world. Perth-based Eden Innovations has been working with hydrogen since the nineties. More than a decade ago it developed a relatively low-cost hydrogen production system in a 50-50 joint venture with the University of Queensland,� and was already scaling it up to commercial production levels by 2007. This patented system of low-temperature pyrolysis of natural gas produces solid carbon nanotubes, rather than carbon dioxide gas, as a by-product.��In 2010 it bought UQ's 50 per cent stake in this pyrolysis system and now owns the intellectual property outright. Eden's hydrogen interests quickly faded in importance as it focused on using its carbon nanotubes by-product as an additive to increase the strength and durability of concrete. �However, with the rise in interest in hydrogen generally, two international companies have recently expressed interest in Eden's hydrogen technologies. Another Australian company, Hazer Group, does something very similar. It, too, breaks down methane, producing hydrogen and solid carbon, in this case high-quality graphite. �Founded in 2010, Hazer is a spin-off from the University of Western Australia, listing on the Australian Stock Market in 2015. �It now has a research partnership with the University of Sydney. Hazer's advantages are that it uses iron ore, rather than more expensive metals, as the catalyst, and the graphite is potentially valuable as a component in lithium-ion batteries.�In December, the Australian Patent Office granted a patent for Hazer's process for producing hydrogen and graphitic carbon from hydrocarbons. More patents are pending. Boosted by $5 mln in funding from the Australian Renewable Energy Agency in 2017, the Victorian company AquaHydrex is commercialising�electrolyser research from the universities of Woollongong and Monash. �The aim is to produce hydrogen for injection into the South Australia gas network. Up to 10 per cent hydrogen can be safely added to natural gas to make it a cleaner fuel. The�Royal Institute of Technology��in Sweden showed last year that standard electrolysis can work with a catalyst combining, nickel, iron and copper, which is considerably cheaper than platinum and other precious metals normally used. The �University of Toronto�has gone for a nickel, copper and�chromium catalyst, which potentially makes it possible to use seawater without the need for desalination first. Also in December,� the CSIRO announced that it had developed a new membrane to separate hydrogen from ammonia -- a development that could greatly increase the viability of exporting hydrogen in the form of ammonia. 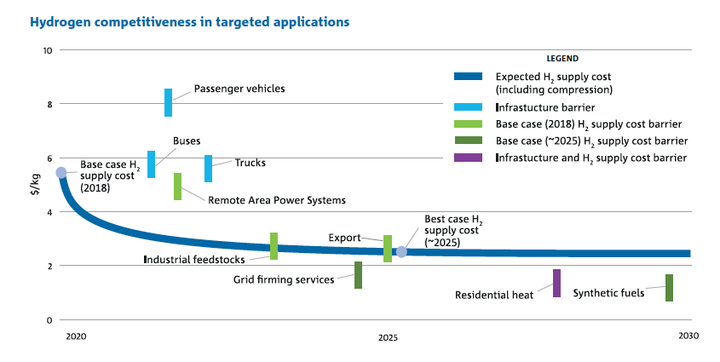 In its National Hydrogen Road Map, in August 2018, the CSIRO said that Australia’s solar, wind, fossil fuels and available land "lend favourably to the establishment of hydrogen exports . . . �Although there is considerable scope for further R&D . . . �the narrative has shifted from one of technology development to market activation", it said. Assuming that it will initially cost almost $6 a kg to produce hydrogen, the CSIRO doesn’t expect exports to be competitive until 2025. In April last year, Heriott-Watt University in Edinburgh announced a breakthrough in using sunlight to split water into hydrogen and oxygen.� The work is a collaboration between �Heriot-Watt, Yale, The City University of Hong Kong, and the East China University of Science and Technology.� According to Envirotec Magazine, the team have potentially reduced the cost of producing hydrogen via photoelectrochemical water-splitting by two-thirds. British and Chinese researchers at the University of Liverpool, University College London and again the East China UST have succeeded in generating hydrogen by beaming sunlight on an organic�sulphur-based catalyst. �Still a long way from commercial application, but perhaps a significant step towards turning water into hydrogen and oxgygen the way plants do it, with photosynthesis. Scientists in Israel last year also found a relatively low-energy way of producing hydrogen using solar energy to split�hydrogen peroxide, which is widely available and sells for around $US400 ($A555) a tonne, depending in concentration. Meanwhile, the City of Aberdeen, once the UK's oil and gas capital, has already started switching its buses and garbage trucks to hydrogen, with a central refuelling depot. �The idea is both�to�provide cleaner air for the citizens and get a toehold on the technologies likely to supercede hydrocarbon fuels. The �Orkney Islands generate so much electricity from wind and tides that they have had to curtail some of their generators, sometimes by as much as 40 or 60 per cent. �Hydrogen is already being produced, taking advantage of surplus electricty from tidal turbines. The islands’ Hydrogen Economic Strategy is �looking into the production of fertiliser, synthetic diesel, and even a hydrogen bunkering facility at Kirkwall to refuel hydrogen ships. In September 2018, researchers from the Idaho National Laboratory said they had developed a new type of electrode that could slash hydrogen production costs using electrolysis operating at 600˚C or less, some 200˚C below the industry norm. This could potentially reduce both the cost of the electricity and the insulation now required. In the UK, the �H2FCSUPERGEN� hydrogen and fuel cell research hub has been operating since 2012 and recently held a three-day conference at Warwick�University �"to create a vision for hydrogen and fuel cells in the UK". In Slovenia, a feasibility study is under way for a zero emissions corridor, which would include a fleet of more than 1,000 hydrogen vehicles and 16 hydrogen clusters with a total capacity of 32 MW of electrolyser hydrogen generation. The study is expected to be completed by 2023. Energy consultancy firm Ecubes Arcola, working with Imperial College, London, demonstrated hydrogen-powered vehicles�at the 2018 Asian Games in Jakarta and Palembang, Indonesia. The firm has a 25-year agreement to develop hydrogen infrastructure and vehicles in Sumatra. In Japan, the Tokyo Olympics next year is being planned as a showcase for hydrogen technologies. �The Ministry of Economy, Trade and Industry’s Hydrogen/Fuel Cell Strategy Roadmap aims to have hydrogen used for mains �power generation in the 2020s. �Kawasaki Heavy Industries is already working on hydrogen powered gas generators, and hopes to have a commercial hydrogen supply train in place by 2030. In Canada, Hydrogenics Corporation�has recently been awarded a contract to design and supply fuel cells for a new lightweight aircraft, to be used for daily commuting. China has been working on hydrogen demonstration projects since at least 2003. �It built its first hydrogen tram in 2015, and had three hydrogen buses runing at the Beijing Olympics. �Its green energy research however, still focuses heavily on solar.